Rugby Africa Gold Cup - Kenya v Tunisia Kenya sevens star Willy Ambaka scored two tries on his test debut in the Rugby Africa Gold Cup 2018 match against Tunisia at the RFUEA Grounds in Nairobi on 11 August. Photo: APO Group. Rugby Africa Gold Cup - Kenya v Tunisia Kenya captain Davis Chenge dives to score a try in the Rugby Africa Gold Cup 2018 match against Tunisia at the RFUEA Grounds in Nairobi on 11 August. Photo: APO Group. 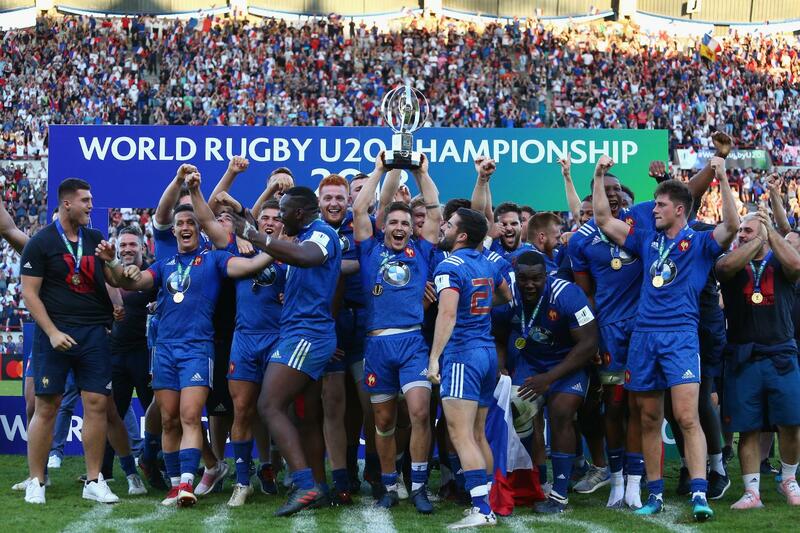 World Rugby U20 Championship 2018: final - England v France France celebrating lifting the World Rugby U20 Championship trophy at the Stade de la Méditerranée in Béziers on 17 June. Photo: Steve Bardens - World Rugby/World Rugby via Getty Images. 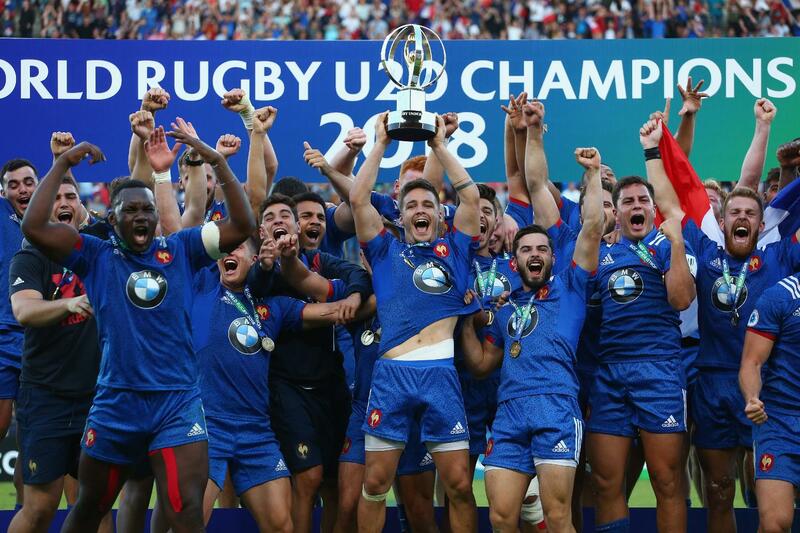 World Rugby U20 Championship 2018: final - England v France France players celebrating with the World Rugby U20 Championship trophy at the Stade de la Méditerranée in Béziers on 17 June. Photo: Steve Bardens - World Rugby/World Rugby via Getty Images. 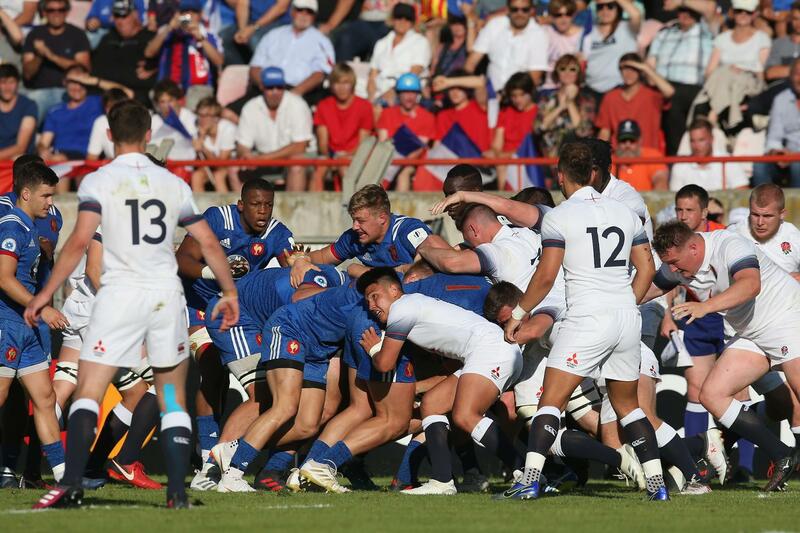 World Rugby U20 Championship 2018: final - England v France France lifting the World Rugby U20 Championship trophy at the Stade de la Méditerranée in Béziers on 17 June, 2018. Photo: Steve Bardens - World Rugby/World Rugby via Getty Images. 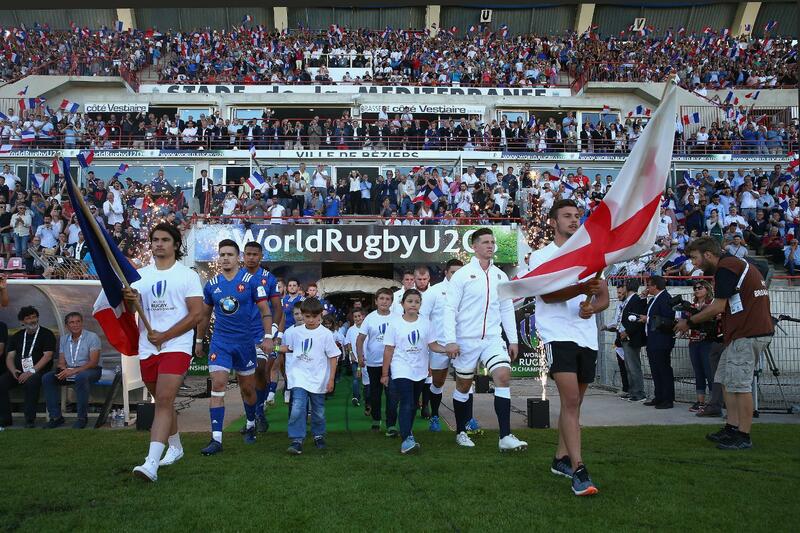 England v France - World Rugby Under 20 Championship Final during the World Rugby Under 20 Championship Final between England and France on June 17, 2018 in Beziers, France. 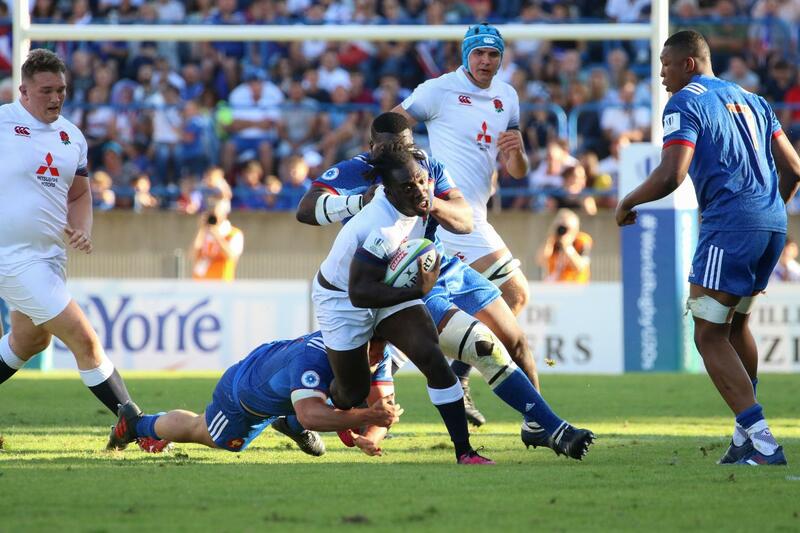 World Rugby U20 Championship 2018: final - England v France England’s Gabriel Ibitoye on the attack during the final on day five of the World Rugby U20 Championship 2018 at the Stade de la Méditerranée in Béziers on 17 June. Photo: Stéphanie Biscaye / World Rugby. 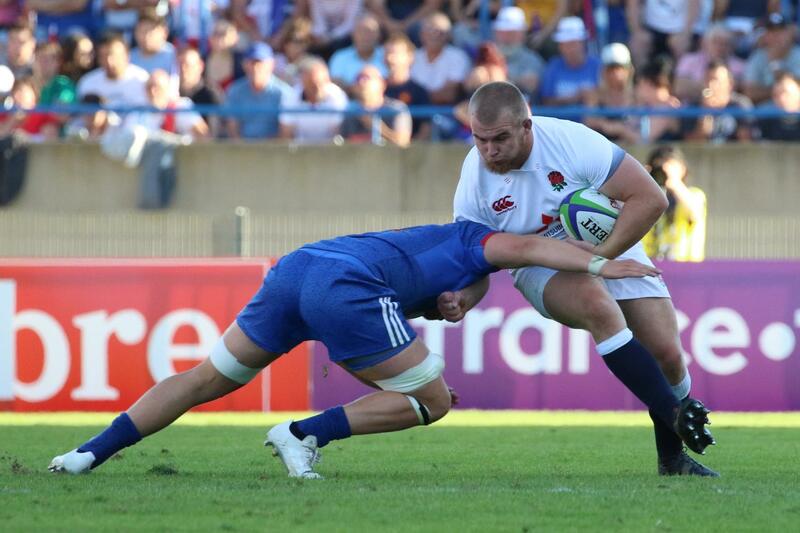 World Rugby U20 Championship 2018 - Day 5 England U20 v France U20 England captain Ben Curry leading from the front on day five of the World Rugby U20 Championship 2018 at the Stade de la Méditerranée in Béziers on 17 June. Photo: Stéphanie Biscaye / World Rugby. 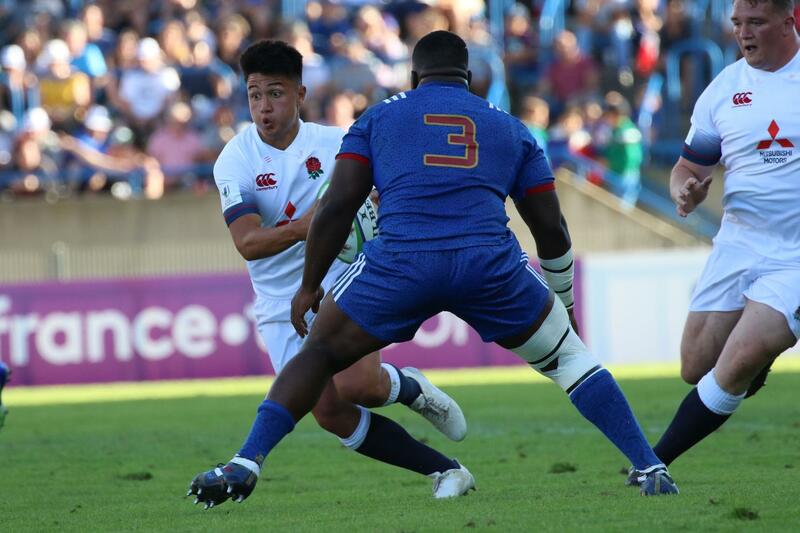 World Rugby U20 Championship 2018: final - England v France England’s Marcus Smith looks to avoid France’s Demba Bamba during the final on day five of the World Rugby U20 Championship 2018 at the Stade de la Méditerranée in Béziers on 17 June. Photo: Stéphanie Biscaye / World Rugby. 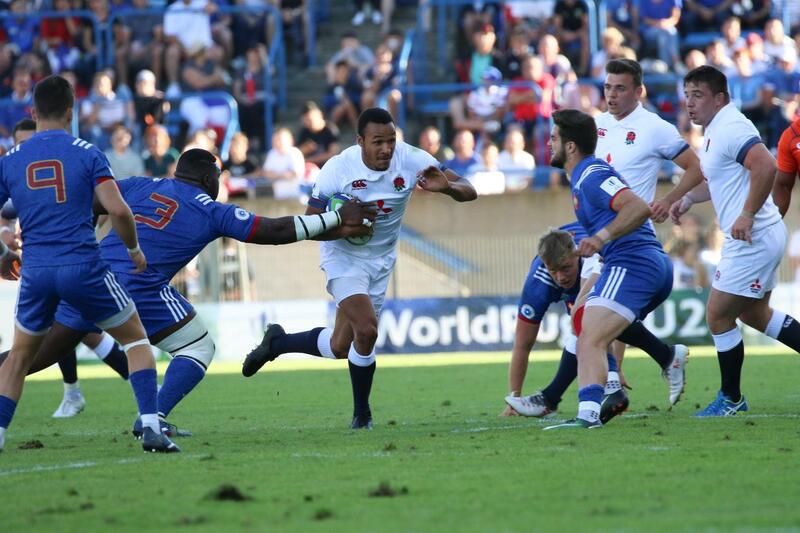 World Rugby U20 Championship 2018: final - England v France England on the attack during the final on day five of the World Rugby U20 Championship 2018 at the Stade de la Méditerranée in Béziers on 17 June. Photo: Stéphanie Biscaye / World Rugby. 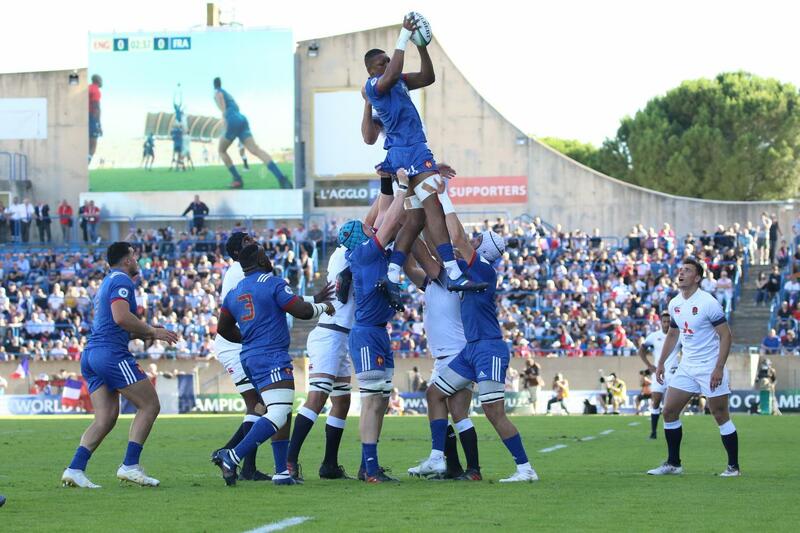 World Rugby U20 Championship 2018: final - England v France France's Cameron Woki is lifted for a lineout during the final on day five of the World Rugby U20 Championship 2018 at the Stade de la Méditerranée in Béziers on 17 June. Photo: Stéphanie Biscaye / World Rugby. 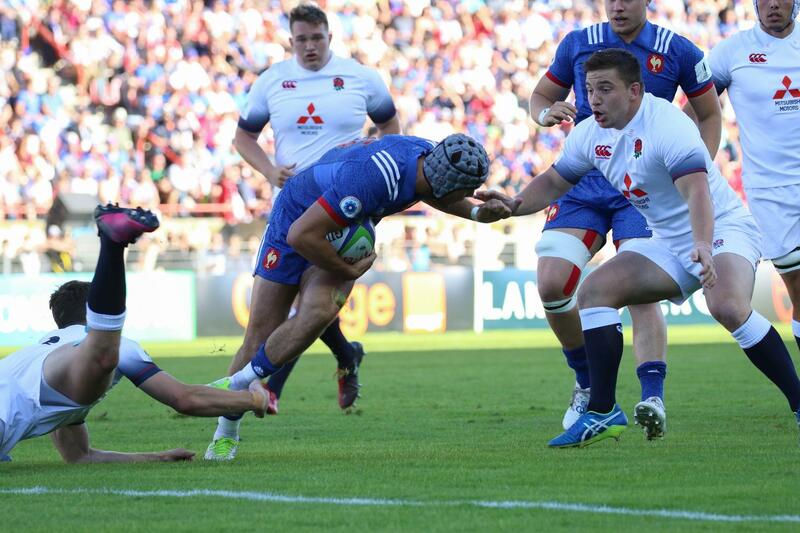 World Rugby U20 Championship 2018 - Day 5 England U20 v France U20 France full-back Clement Laporte tries to break through the England defence on day five of the World Rugby U20 Championship 2018 at the Stade de la Méditerranée in Béziers on 17 June. Photo: Stéphanie Biscaye / World Rugby. 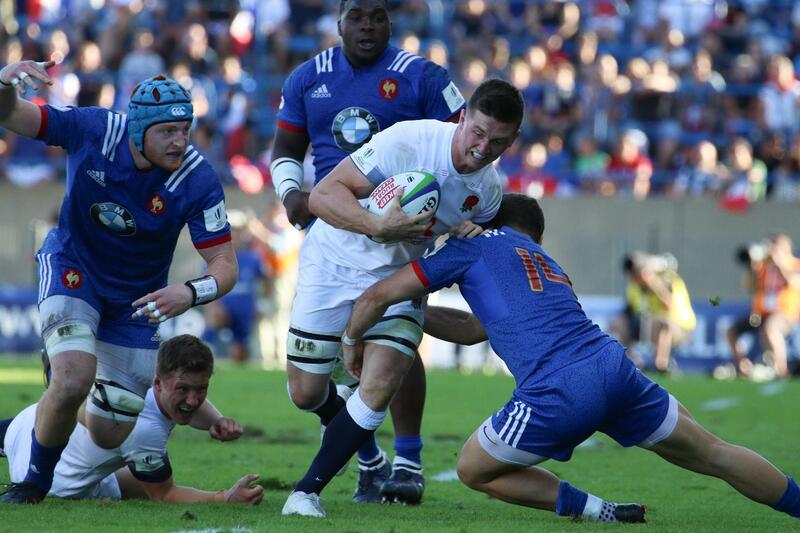 World Rugby U20 Championship 2018: final - England v France France attacking during the final on day five of the World Rugby U20 Championship 2018 at the Stade de la Méditerranée in Béziers on 17 June. Photo: Stéphanie Biscaye / World Rugby. 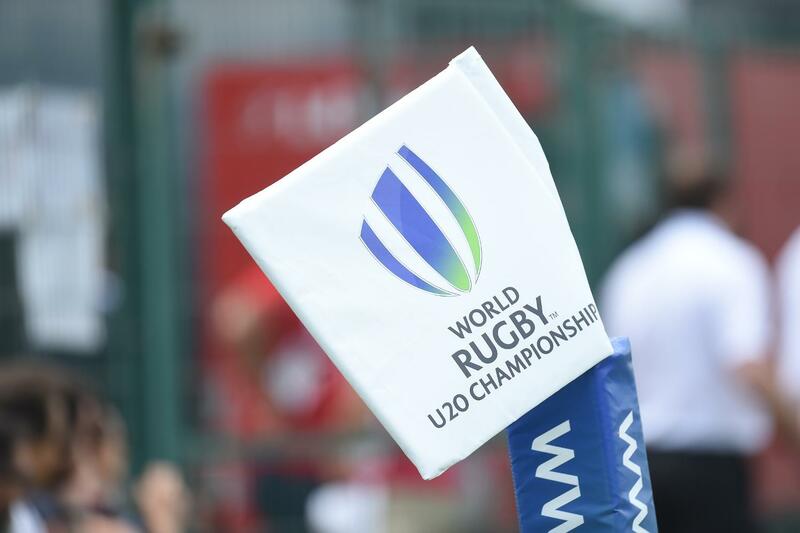 World Rugby U20 Championship 2018: final - England v France England and France take to the field for the World Rugby U20 Championship final at the Stade de la Méditerranée in Béziers on 17 June. Photo: Steve Bardens - World Rugby/World Rugby via Getty Images. World Rugby U20 Championship 2018: Seventh place play-off - Wales v Italy Wales flanker Dan Davis tries to burst through a tackle during their seventh place play-off with Italy on day five of the World Rugby U20 Championship 2018 at the Stade de la Méditerranée in Béziers on 17 June. Photo: Alexandre Dimou / World Rugby. 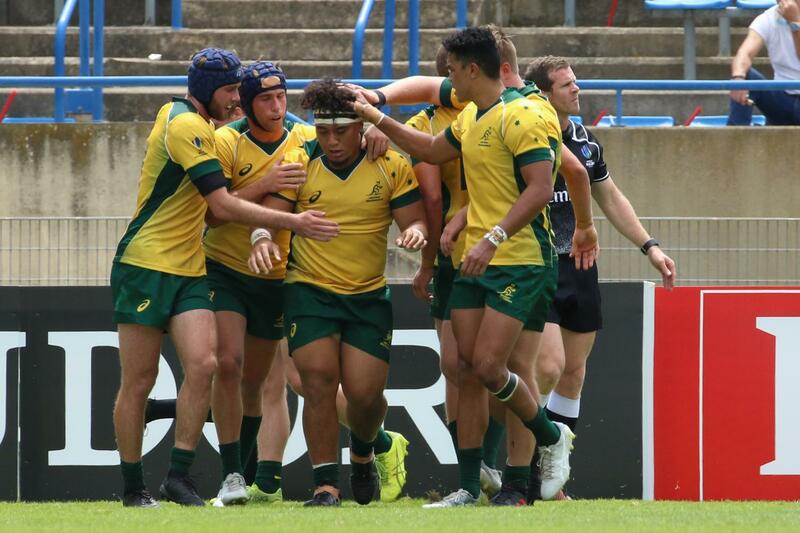 World Rugby U20 Championship 2018: Third place play-off - South Africa v New Zealand New Zealand second-row Waimana Riedlinger-Kapa scores a first-half try under the posts during their third place play-off with South Africa on day five of the World Rugby U20 Championship 2018 at the Stade de la Méditerranée in Béziers on 17 June. Photo: Stéphanie Biscaye / World Rugby. 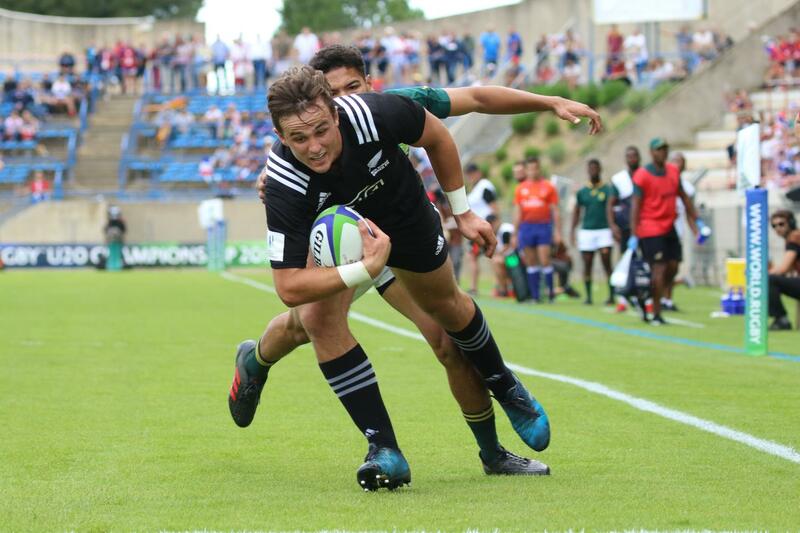 World Rugby U20 Championship 2018: Third place play-off - South Africa v New Zealand New Zealand centre Harry Plummer scores a try during their third place play-off with South Africa on day five of the World Rugby U20 Championship 2018 at the Stade de la Méditerranée in Béziers on 17 June. Photo: Stéphanie Biscaye / World Rugby. World Rugby U20 Championship 2018: Seventh place play-off - Wales v Italy Wales scrum-half Harri Morgan passes the ball during their seventh place play-off with Italy on day five of the World Rugby U20 Championship 2018 at the Stade de la Méditerranée in Béziers on 17 June. 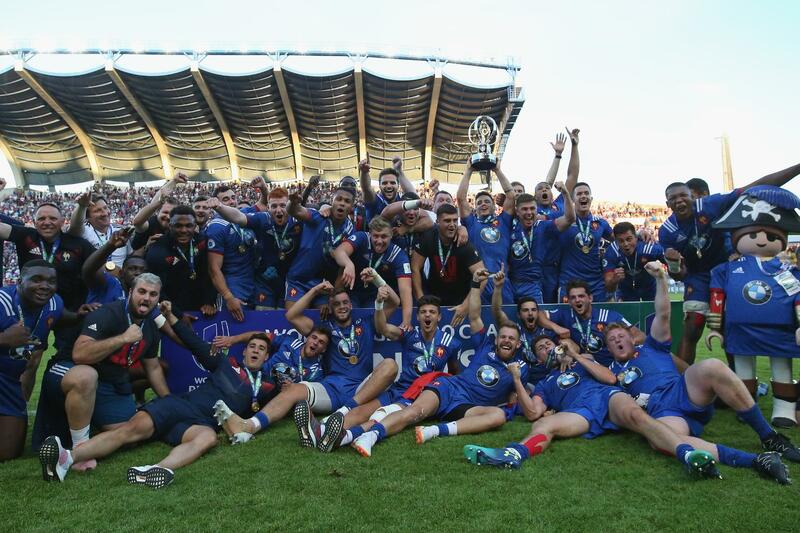 Photo: Alexandre Dimou / World Rugby. World Rugby U20 Championship 2018: Seventh place play-off - Wales v Italy Wales flanker Dan Davis climbs to catch the ball during their seventh place play-off with Italy on day five of the World Rugby U20 Championship 2018 at the Stade de la Méditerranée in Béziers on 17 June. Photo: Alexandre Dimou / World Rugby. World Rugby U20 Championship 2018: Seventh place play-off - Wales v Italy Italy flanker Lodovico Manni tries to burst through the Wales defence during their seventh place play-off on day five of the World Rugby U20 Championship 2018 at the Stade de la Méditerranée in Béziers on 17 June. 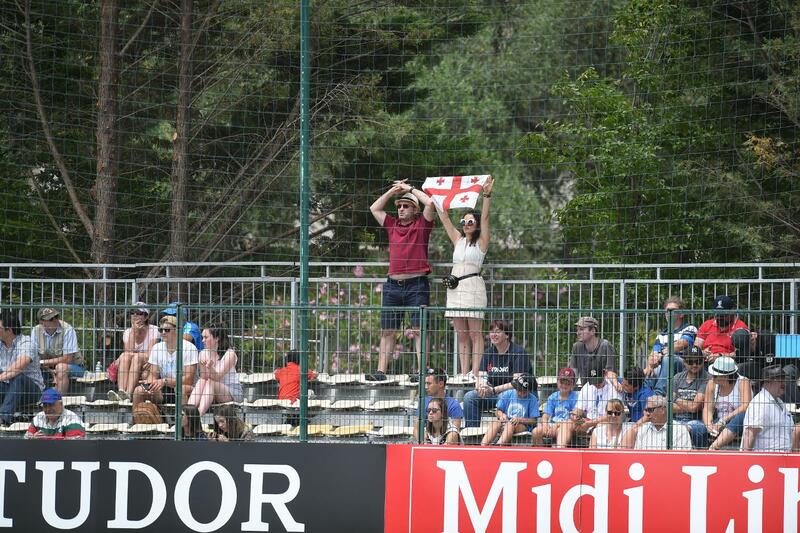 Photo: Alexandre Dimou / World Rugby. 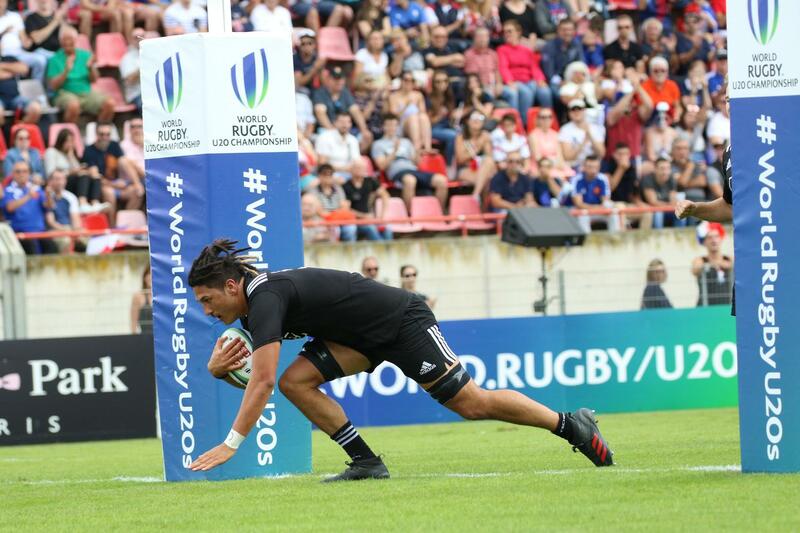 World Rugby U20 Championship 2018: Seventh place play-off - Wales v Italy Italy winger Alessandro Fusco tries to avoid a Wales tackle during their seventh place play-off on day five of the World Rugby U20 Championship 2018 at the Stade de la Méditerranée in Béziers on 17 June. Photo: Alexandre Dimou / World Rugby. 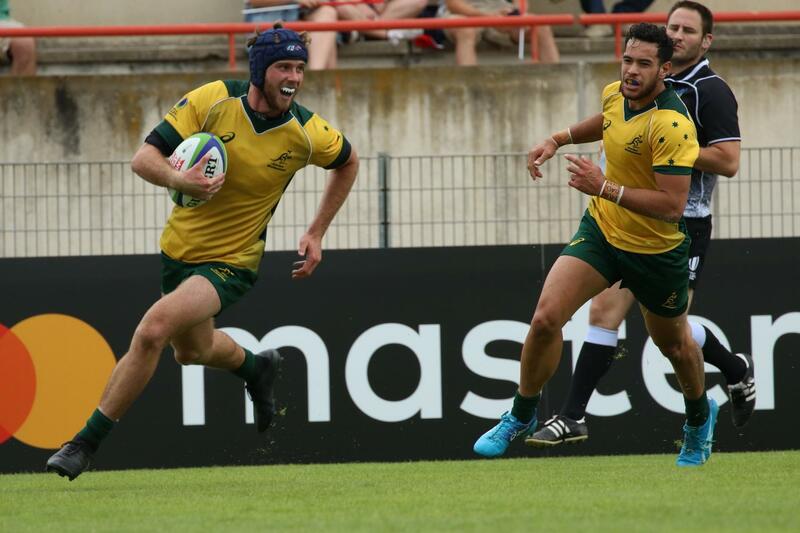 World Rugby U20 Championship 2018: Seventh place play-off - Wales v Italy Italy centre Damiano Mazza is tackled by Wales' Ioan Nicholas and Rhys Davies in their seventh place play-off on day five of the World Rugby U20 Championship 2018 at the Stade de la Méditerranée in Béziers on 17 June. Photo: Alexandre Dimou / World Rugby. 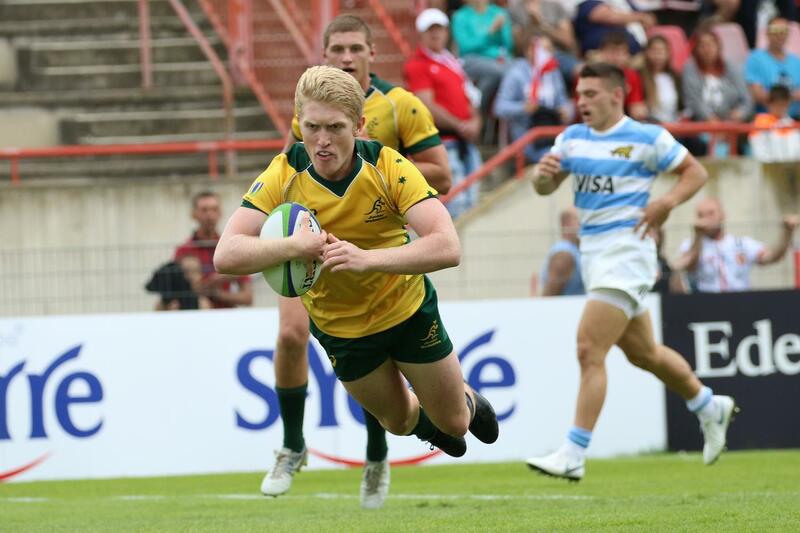 World Rugby U20 Championship 2018: Fifth place play-off - Argentina v Australia Australia centre Isaac Lucas dives to score a try in their fifth place play-off with Argentina on day five of the World Rugby U20 Championship 2018 at the Stade de la Méditerranée in Béziers on 17 June. Photo: Stéphanie Biscaye / World Rugby. 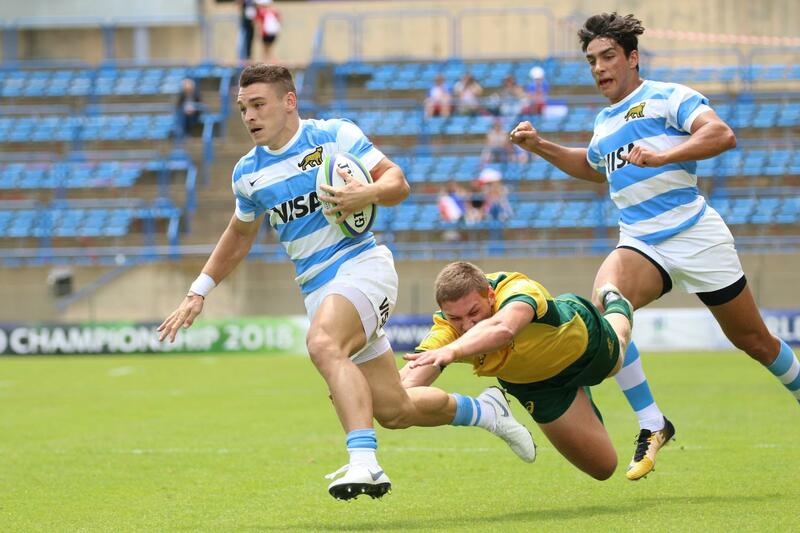 U20 Championship 2018 - Day 5 Argentina U20 v Australia U20 Australia replacement William Harrison makes a break during their fifth place play-off with Argentina on day five of the World Rugby U20 Championship 2018 at the Stade de la Méditerranée in Béziers on 17 June. Photo: Stéphanie Biscaye / World Rugby. 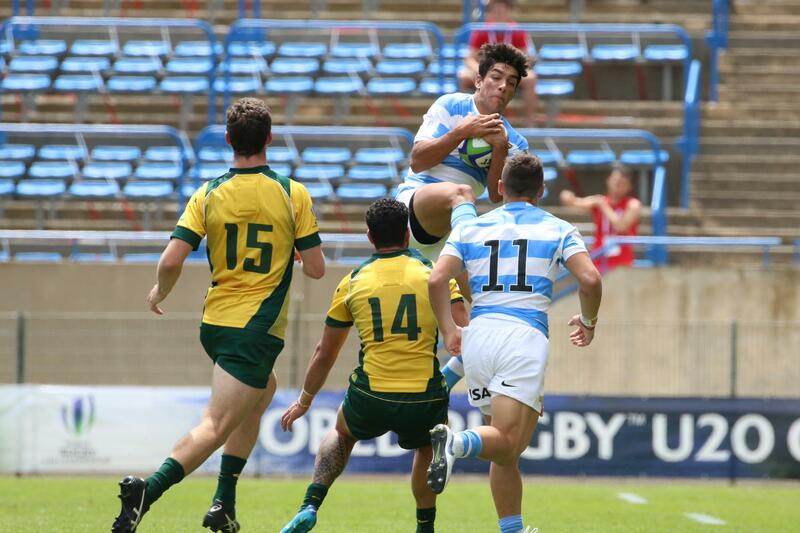 World Rugby U20 Championship 2018: Fifth place play-off - Argentina v Australia Argentina scrum-half Gonzalo Garcia puts in a clearance kick during their fifth place play-off with Australia on day five of the World Rugby U20 Championship 2018 at the Stade de la Méditerranée in Béziers on 17 June. Photo: Stéphanie Biscaye / World Rugby. 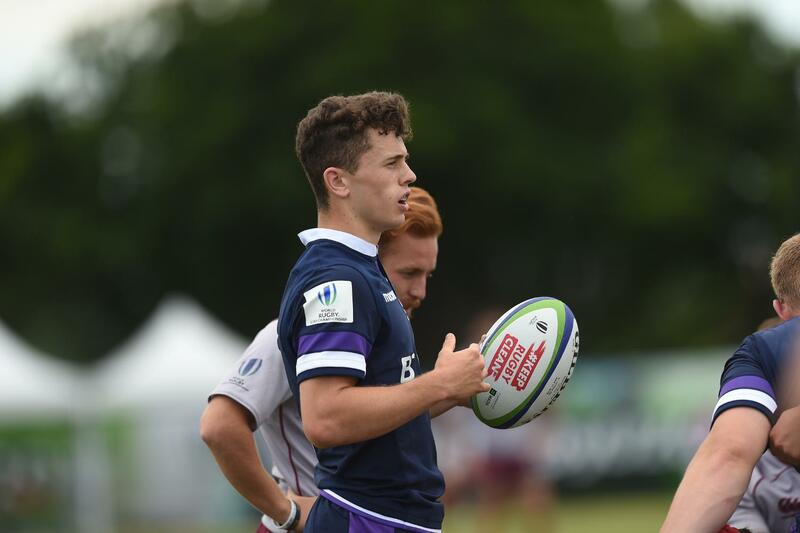 World Rugby U20 Championship 2018: Ninth place play-off - Scotland v Georgia Scotland scrum-half Charlie Chapman looks on during their ninth place play-off on day five of the World Rugby U20 Championship 2018 at the Stade de la Méditerranée in Béziers on 17 June. Photo: Stéphanie Biscaye / World Rugby. 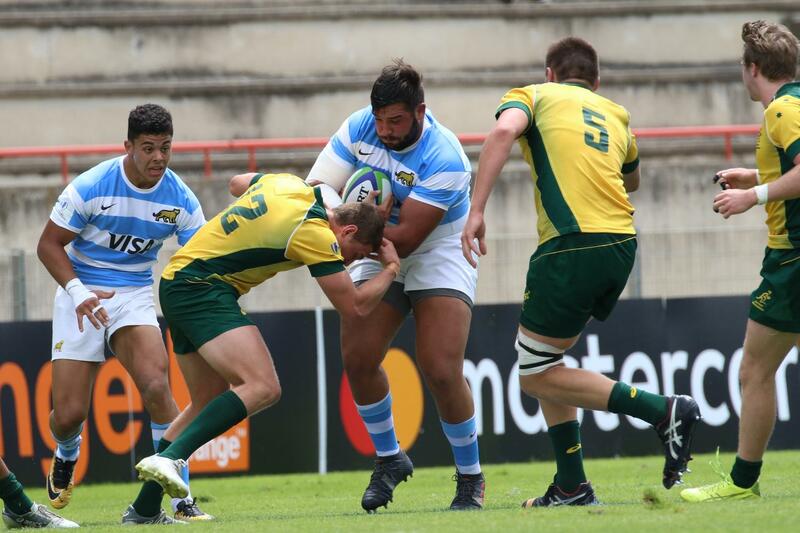 World Rugby U20 Championship 2018: Fifth place play-off - Argentina v Australia Argentina prop Lucio Sordoni on the charge in their fifth place play-off with Australia on day five of the World Rugby U20 Championship 2018 at the Stade de la Méditerranée in Béziers on 17 June. Photo: Stéphanie Biscaye / World Rugby. 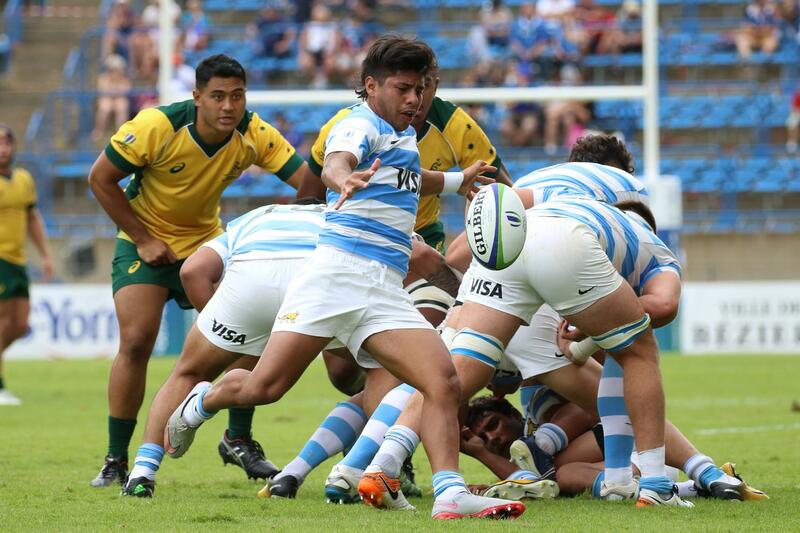 World Rugby U20 Championship 2018: Fifth place play-off - Argentina v Australia Argentina number eight Juan Bautista Pedemonte tries to burst through the Australia defence during their fifth place play-off on day five of the World Rugby U20 Championship 2018 at the Stade de la Méditerranée in Béziers on 17 June. Photo: Stéphanie Biscaye / World Rugby. 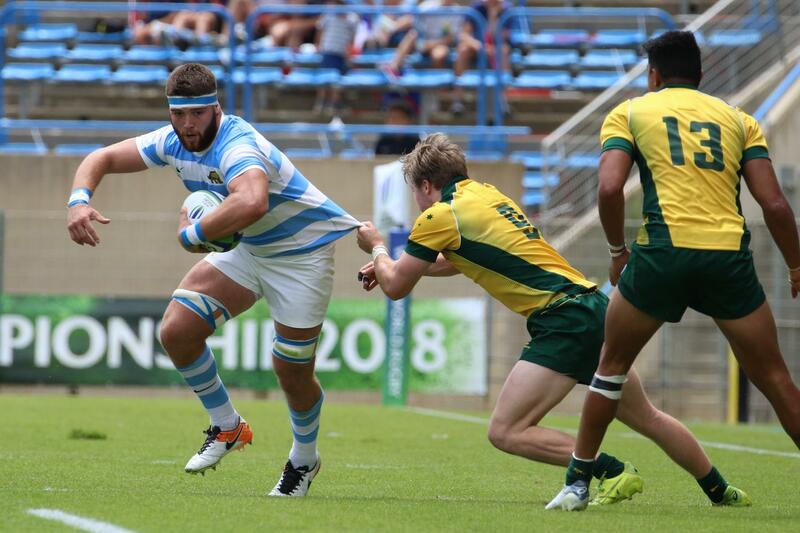 World Rugby U20 Championship 2018: Fifth place play-off - Argentina v Australia Argentina full-back Santiago Carreras soars to catch the ball during their fifth place play-off with Australia on day five of the World Rugby U20 Championship 2018 at the Stade de la Méditerranée in Béziers on 17 June. Photo: Stéphanie Biscaye / World Rugby. 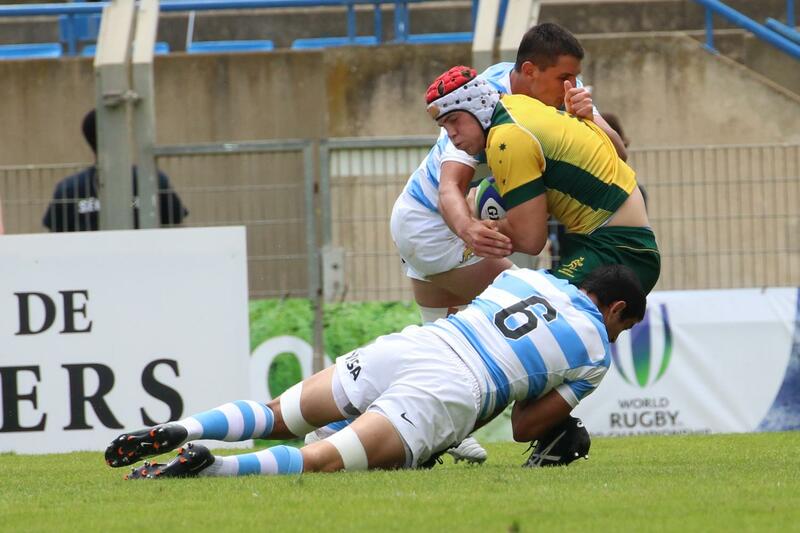 World Rugby U20 Championship 2018: Fifth place play-off - Argentina v Australia Argentina winger Mateo Carreras evades a desperate Australia tackle to score a try in their fifth place play-off on day five of the World Rugby U20 Championship 2018 at the Stade de la Méditerranée in Béziers on 17 June. Photo: Stéphanie Biscaye / World Rugby. 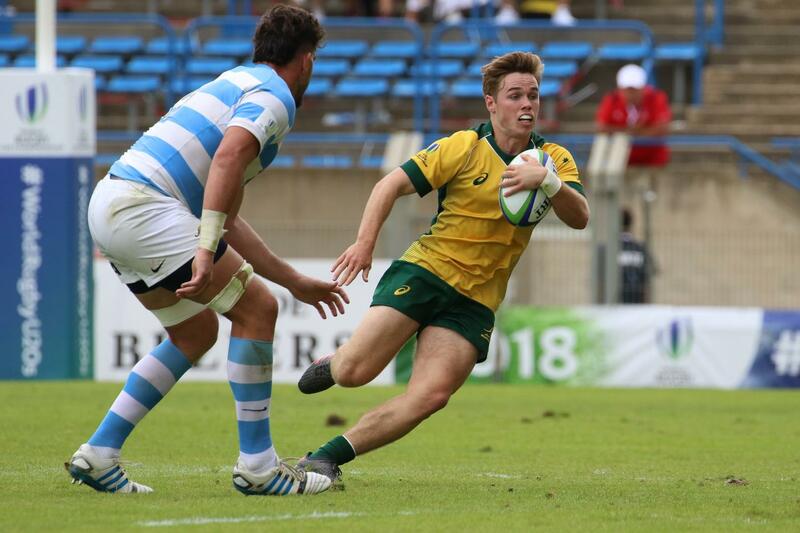 World Rugby U20 Championship 2018: Fifth place play-off - Argentina v Australia Australia flanker Fraser McReight is wrapped up by the Argentina defence during their fifth place play-off on day five of the World Rugby U20 Championship 2018 at the Stade de la Méditerranée in Béziers on 17 June. Photo: Stéphanie Biscaye / World Rugby. 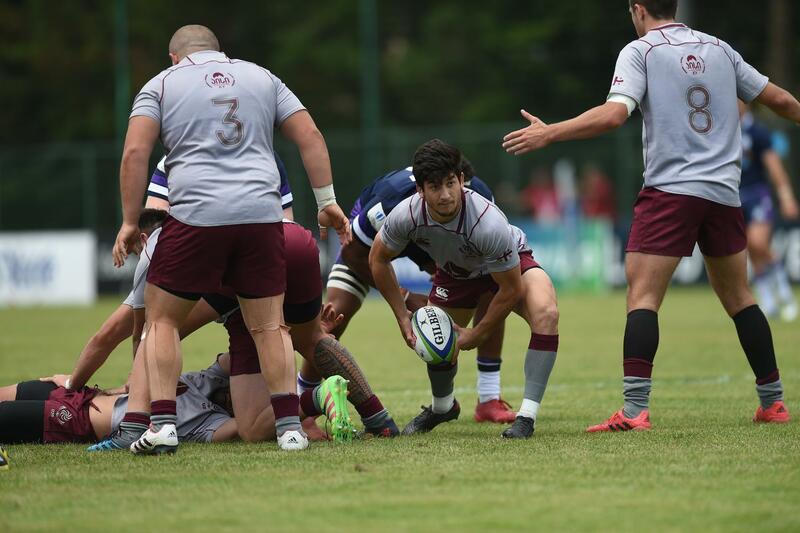 World Rugby U20 Championship 2018: Ninth place play-off - Scotland v Georgia The corner flag at the World Rugby U20 Championship 2018 on 17 June. Photo: Alexandre Dimou / World Rugby. 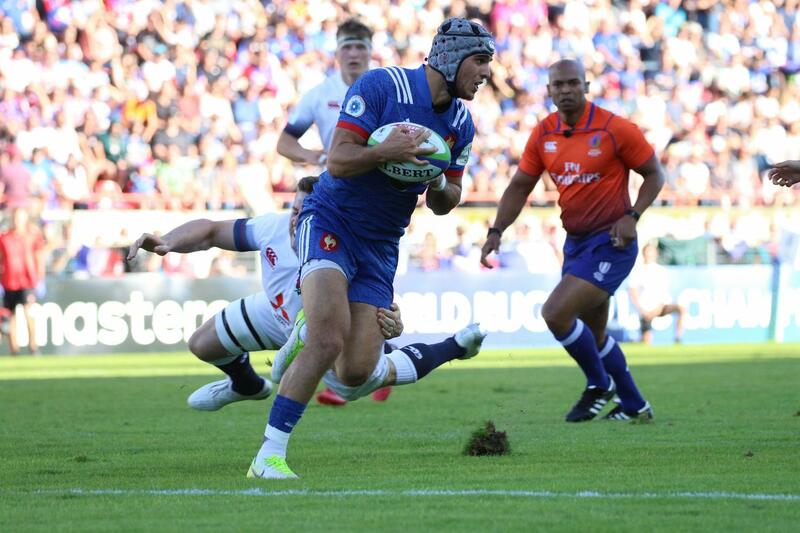 World Rugby U20 Championship 2018: Ninth place play-off - Scotland v Georgia Georgia scrum-half Gela Aprasidze prepares to pass in their ninth place play-off with Scotland on day five of the World Rugby U20 Championship 2018 at the Stade de la Méditerranée in Béziers on 17 June. Photo: Alexandre Dimou / World Rugby. 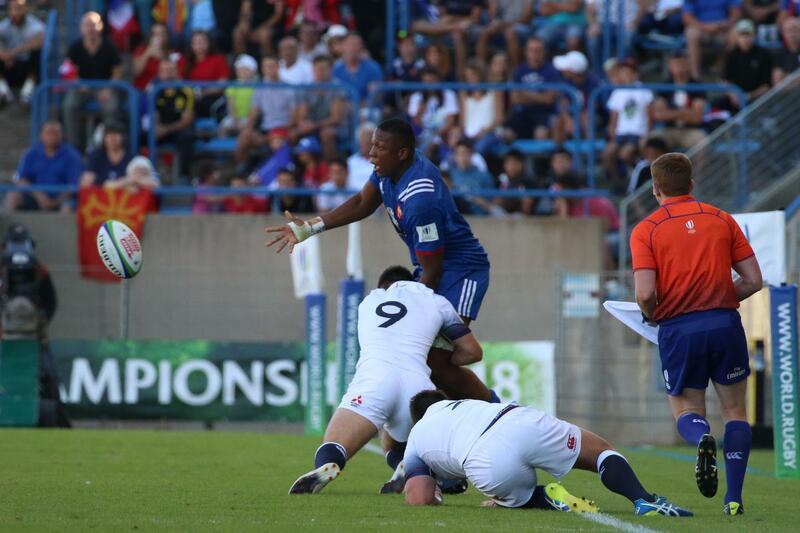 World Rugby U20 Championship 2018: Ninth place play-off - Scotland v Georgia Scotland players celebrate after scoring the opening try against Georgia in their ninth place play-off on day five of the World Rugby U20 Championship 2018 at the Stade de la Méditerranée in Béziers on 17 June. Photo: Alexandre Dimou / World Rugby. World Rugby U20 Championship 2018: Ninth place play-off - Scotland v Georgia Scotland full-back Paddy Dewhirst is tackled in their ninth place play-off with Georgia on day five of the World Rugby U20 Championship 2018 at the Stade de la Méditerranée in Béziers on 17 June. Photo: Alexandre Dimou / World Rugby. 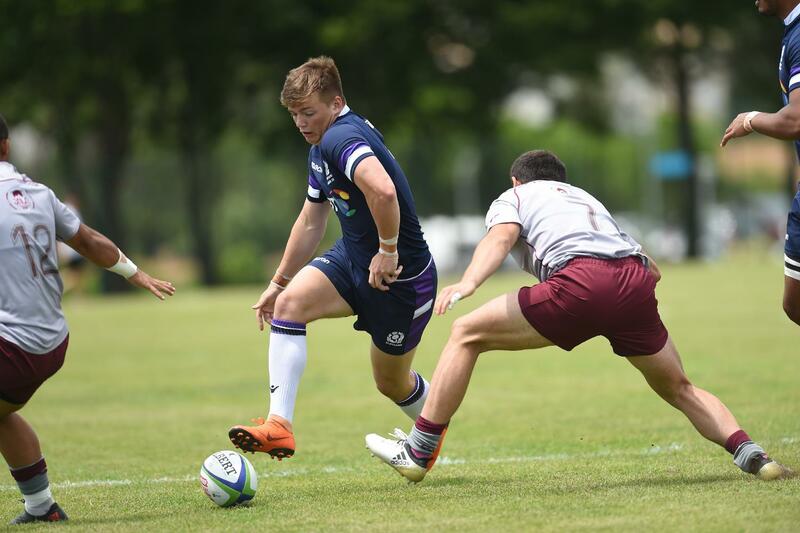 World Rugby U20 Championship 2018: Ninth place play-off - Scotland v Georgia Scotland centre Cammy Hutchison puts a kick through in their ninth place play-off with Georgia on day five of the World Rugby U20 Championship 2018 at the Stade de la Méditerranée in Béziers on 17 June. Photo: Alexandre Dimou / World Rugby. 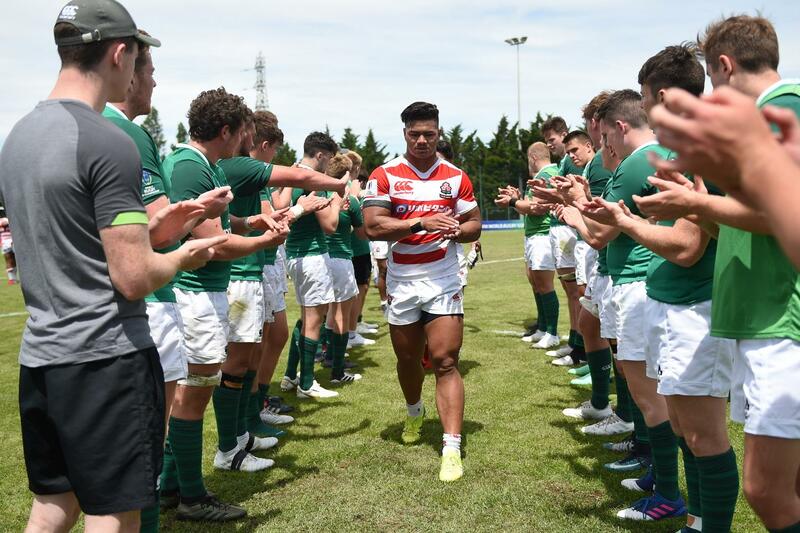 World Rugby U20 Championship 2018: 11th place play-off - Ireland v Japan Ireland players clap off the Japan team after their 11th place play-off on day five of the World Rugby U20 Championship 2018 at the Stade de la Méditerranée in Béziers on 17 June. Photo: Alexandre Dimou / World Rugby. 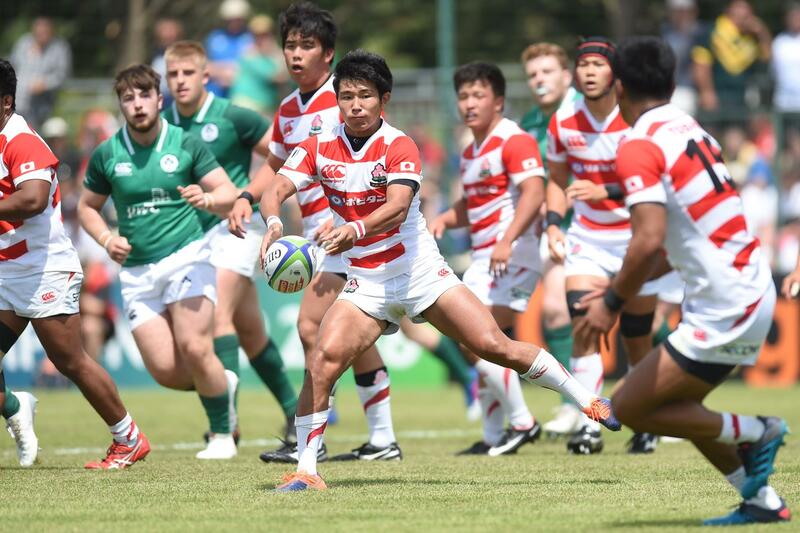 World Rugby U20 Championship 2018: 11th place play-off - Ireland v Japan Japan scrum-half Yuto Mori passes the ball during their 11th place play-off with Ireland on day five of the World Rugby U20 Championship 2018 at the Stade de la Méditerranée in Béziers on 17 June. Photo: Alexandre Dimou / World Rugby. 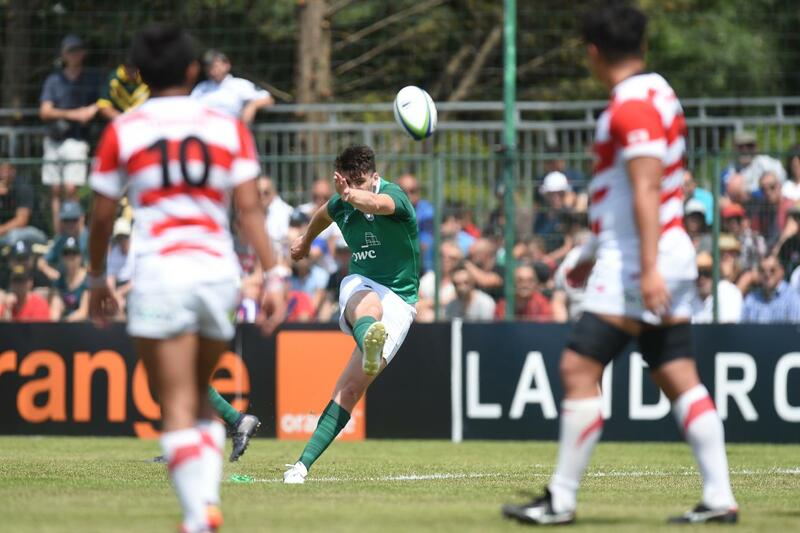 World Rugby U20 Championship 2018: 11th place play-off - Ireland v Japan Ireland's Harry Byrne kicks for goal during their 11th place play-off with Japan on day five of the World Rugby U20 Championship 2018 at the Stade de la Méditerranée in Béziers on 17 June. Photo: Alexandre Dimou / World Rugby. 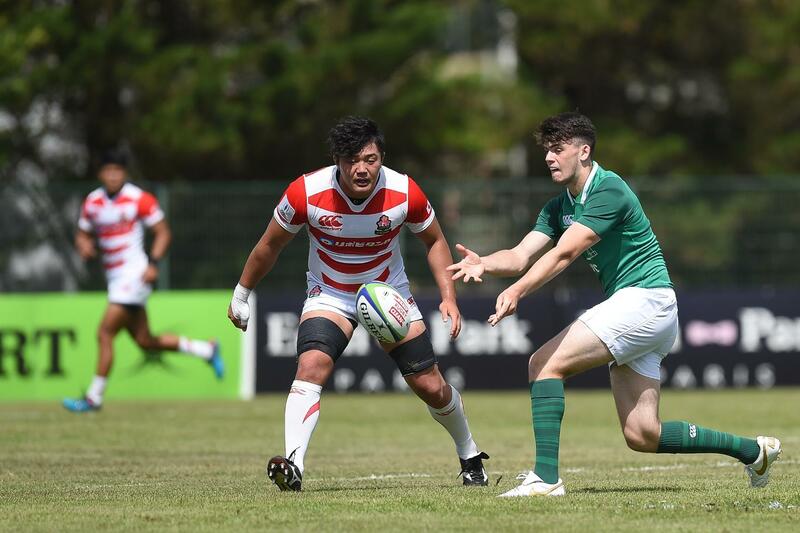 World Rugby U20 Championship 2018: 11th place play-off - Ireland v Japan Japan winger Halatoa Vailea tries to find a way through the Ireland defence during their 11th place play-off on day five of the World Rugby U20 Championship 2018 at the Stade de la Méditerranée in Béziers on 17 June. Photo: Alexandre Dimou / World Rugby. 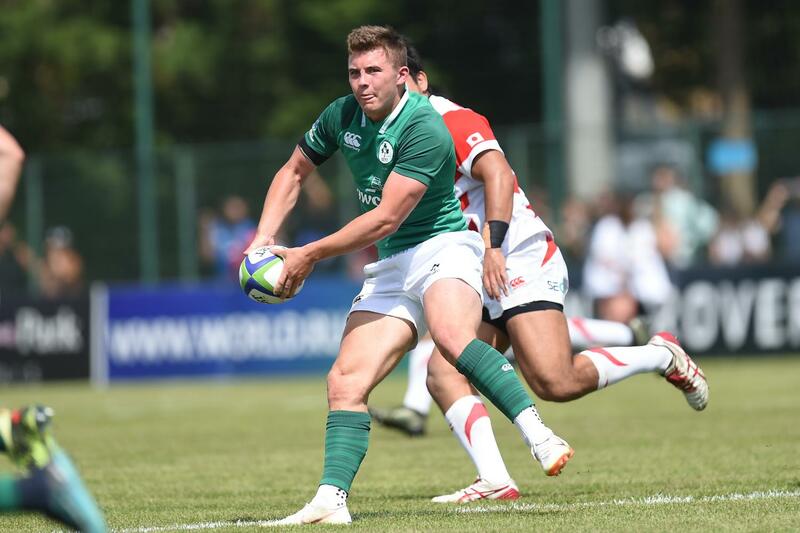 World Rugby U20 Championship 2018: 11th place play-off - Ireland v Japan Ireland winger Sean O'Brien looks to pass during their 11th place play-off with Japan on day five of the World Rugby U20 Championship 2018 at the Stade de la Méditerranée in Béziers on 17 June. 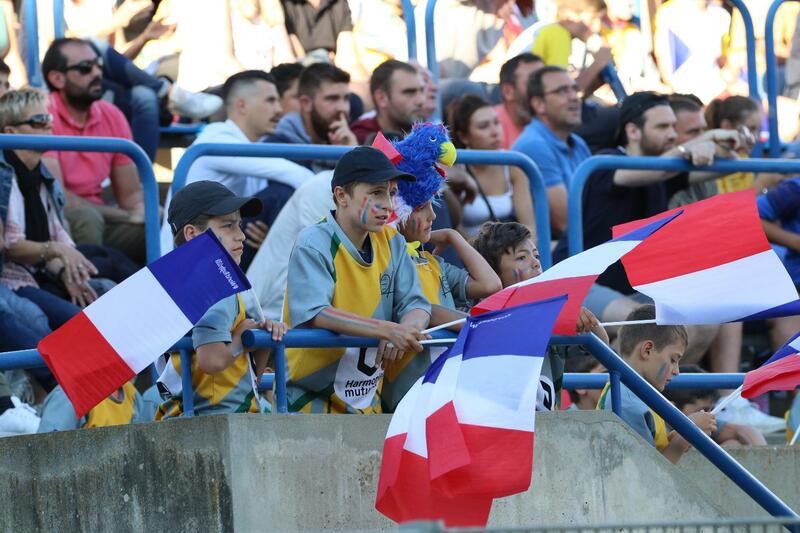 Photo: Alexandre Dimou / World Rugby. 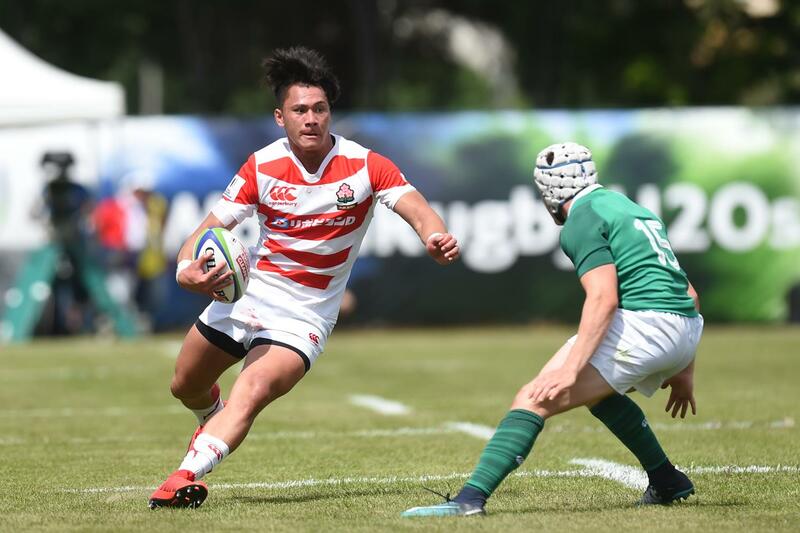 World Rugby U20 Championship 2018: 11th place play-off - Ireland v Japan Ireland fly-half Harry Byrne passes during their 11th place play-off with Japan on day five of the World Rugby U20 Championship 2018 at the Stade de la Méditerranée in Béziers on 17 June. Photo: Alexandre Dimou / World Rugby.